Pictured above is the Ekco A23. This set was released a year after the last “Round” Ekco, considered on the previous page. This set has no outstanding points of interest, but none-the-less it has become rather collectable anyway. 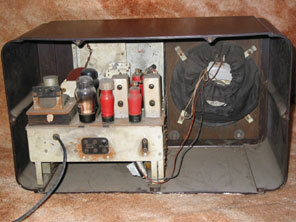 As bakelite sets go it is very large, measuring 22” x 13” x 10”. Considering the cabinet is so large, it is rather surprising that there seems to be so much wasted space within the cabinet (so picture lower in page). The set is a fairly standard superhet, featuring a valve line-up of ECH35, EF39, EBC33, EL33, AZ31. The receiver is provided with five pushbuttons. The actual stations selected by the pushbuttons may be changed by removing the escutcheon that surrounds the five buttons. Once the plate is removed access is gained to a bank of five oscillator coil cores and five aerial trimmers. To change a station selected by a pushbutton it is merely necessary to depress the appropriate button, then adjust the cores and trimmers with a small screwdriver, using the desired station as the signal source. It should be noted that each pushbutton has a tunable range, the five pushbuttons between them covering the whole MW/LW band (i.e. it would not be possible to set five stations between 200m and 300m as pushbuttons). When pushbutton tuning is in operation two lamps that illuminate the main tuning scale are extinguished, and a lamp glows within the pushbutton area to indicate pushbutton selection is in use. The only other notable point about this receiver is that it featured a band where television sound could be tuned in. This is because some people bought “vision only” television receivers, and relied on the radio receiver to provide the audio component of the television broadcast. This idea did not really catch on however, as it saved comparatively little money in the cost of construction of a television receiver, and made for disconcerting viewing if the sound was coming from another area of the room remote from the television screen. The receiver cost £25.10.4. 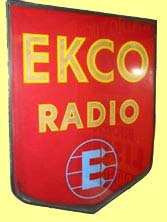 Shown right is a glass advertising sign used by Ekco in the mid to late 1940's. Shaped like a shield, it incorporated their new "E" logo. 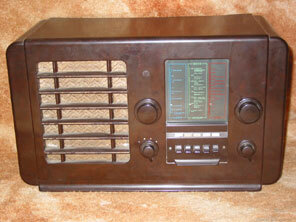 Continue to the first Ekco clock-radio, the A33 "Radiotime"